There used to be an understanding that the early "away" races of an F1 season were bad pointers to form for the season. Often, it was said of the first GPs in Europe that "the season starts here" - and there was a lot of truth in that. It is not so clear cut these days, even though the teams tend to look forward to Barcelona as their opportunity to improve upon any poor results thus far. Since all the teams are beavering away at tweaks to make their cars more competitive, relative form tends to remain much the same as everyone increases the pace of development. There is even a case for saying that the first race of the year provides the clue to the drivers' championship. Last year, Kimi Raikkonen won in Melbourne and, despite a very inconsistent season and a strong challenge from his team mate, he came through at the last to be champion. In 2006, Fernando Alonso won the first race, the Bahrain GP, going on from there to his second championship. The fact that Bahrain was the beginning of the season that year might have weakened our theory - except that Fernando did us the favor of winning in Melbourne too. 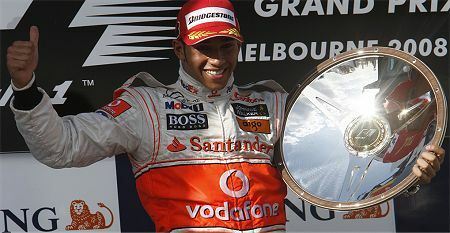 So maybe it is the Australian GP that indicates the future champion. When we go back as far as 2005, however, things begin to break down; Giancarlo Fisichella threw a spanner in the works by winning his only race of the year in Melbourne. But at least he was driving the car that was to win the constructors' title, the Renault R25. So perhaps our theory applies more to the constructor than the driver. In fact, we have to go back as far as 2003 before we run into an Australian GP where the winner did not go on to help his team win the constructors' championship - David Coulthard was the man who messed us up on that occasion. Four years of success in predicting the winning team is not a bad record, however, especially when we recall that this may be a new trend, overcoming the old adage that the season starts in Europe. If we place any faith in the theory, it would mean that McLaren will be champion this year. On form since Melbourne, that looks a rather hazardous bet - most pundits are going for Ferrari as winners again. But it will be an interesting test of our theory - if McLaren do win in the end, the Australian GP strengthens its claim to be the one indicator that cuts through all the changes in fortune throughout the year. Turning back to the coming weekend's GP in Barcelona, it is expected that true form will emerge at last and we will have a better idea of how the season will pan out. Yet that is a debatable point as well; in 2007 Ferrari won in Spain with Massa aboard but the next three races were taken by McLaren. Without the constant interference of the FIA, it is quite likely that McLaren would have won the championship too. That last is a red herring that I could not resist, of course. If any theory is to gain credence, it must function despite any outside factors; we are only interested in pointers towards reality, not what might have been. And the Australian GP theory is as good as any at the moment. If you fancy a flutter on the final outcome of the constructors' championship, you would do well to include the Oz Theory in your calculations. Not being a betting man, this matter of predicting winners is merely interesting to me and I take no notice of history and statistics when guessing future champions. That is much more of a discussion between the heart and the head, with a little intuition thrown in, perhaps. The Oz Theory is a fragile quirk, after all, and it becomes more so with each year that it holds good. The likelihood of an upset must always increase as the years pass. I'm with you, Clive. The statistics are wonderful to look at, evaluate and extract meaning from. Ah, 'tis my honour to receive a visit from the delightful Ms Blachford, so fresh from her recent nuptials. Allow me to take this opportunity of once again congratulating you and your esteemed (though nameless) husband. May you and Sidey podcast and blog in complete happiness and harmony through the coming years and prosperity guide your feet all the days of your life! Oh, come on, Christine. You ARE in harmony! Think yin and yang. Hahaha! To add to Journeyer's post above, there were race incidents involving the polesitters in the 2 "exceptional" races. (Massa and Alonso in 2007. Raikkonen and Schumacher in 2005.) In each case, not only did the polesitter NOT go on to win the championship, but the other driver involved ended up 3rd in the championship. Hey rohan, correct me if I'm wrong, but wasn't there also an incident involving polesitter Schumi in 2003? I think this was when Barrichello almost went round the outside of him but he kinda squeezed his teammate out onto the gravel? Rubens continued though. Sorry! I had a bit too much time this morning. I never ceased to be amazed how easy it is to entirely misinterpret the written word. Owing to a shortage of time I was scanning through the comments and thought you had refered to Christine's husband as Sidey Podcast. Since I was scanning rather than reading I missed the following 'and' and it still made perfect sense. I guess the brain copes with whatever is thrown at it and finds a pattern that it can make sense of just like it does with the stats. I didn't think this comment was in anyway related to the subject matter when I started but my brain found a pattern there too. If only I could get it to see a pattern in the lottery numbers. Hmm... Extrapolating from Journeyer's post, the eventual position of the non-championship-winning polesitter in the championship is his position in his team at year end (#1 for Kimi, #2 for Massa) multiplied by the number of times the Barcelona polesitter hasn't won the championship (twice) - that's a second for Kimi in 2005 and a 4th for Massa in 2007. I guess such parallel thinking is bound to happen on occasion. But thanks for all the extra interesting coincidences - pole for Barcelona suddenly becomes all-important!